Fighting for Your Marriage 3 Edition A thorough revision with a new DVD of couples in action, using the PREP method for strengthening marriage and avoiding divorce court The third edition of the best-selling classic on marriage enhancement and divorce prevention, features the latest research and changes of heart in our culture and society. New and revised, Fighting for Your Marriage is based on the widely acclaimed PREP (Prevention and Relationship Enhancement Program) approach. Groundbreaking studies have found that couples can use the strategies of this approach to handle conflict more constructively, protect their happiness, and reduce the odds of breaking up. 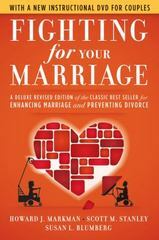 The book is based on more than twenty years of university research Explores how to apply the PREP approach to any marriage Shows couples how to talk more and fight less, deepen and protect their friendship, and keep the fun alive Reveals what it takes to have a more intimate, sensual relationship and how to clarify and act on priorities The authors have included a wealth of techniques and down-to-earth guidance for all couples who seek to promote greater character and pleasure in their long-term relationships.